Since its inception in 2010, Everlane has become a fashion favorite thanks to its commitment to “radical transparency.” The direct-to-consumer brand based in San Francisco provides customers with a detailed look into where their garments come from and how much their garments truly cost to make. Now, Everlane has a new commitment — to be completely free of virgin plastic by 2021. On Tuesday, co-founder Michael Preysman, along with investors Natalie Massenet and Nick Brown, announced Everlane’s plan at a dinner on the rooftop of the Brooklyn Grange farm. 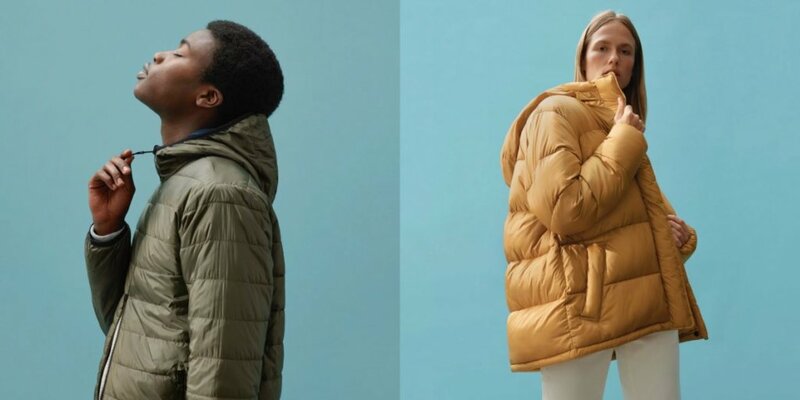 These puffer jackets made from plastic are two of 13 new sustainable styles Everlane is dropping on October 24. The company will also shift its practices when it comes to other commonly used materials like nylon and polyester, both of which are made from virgin plastic. Over the next three years, Everlance will stop producing anything with virgin plastic in it. All of the company’s materials will be made from plastic water bottles and renewed materials. Temperatures dipped into the 40s during the dinner and guests were given Everlane blankets and sweaters from its new ReNew fleece, which are made from recycled plastic.